This tutorial demonstrates how to use specific Steps in the Flow Designer to get values from an Excel Document	, and how to Update	values in the Excel Document (Set Values, Replace Values, Delete Row, etc.) These Steps	can be found in Data > List > Excel and CSV	category in the ToolBox	. 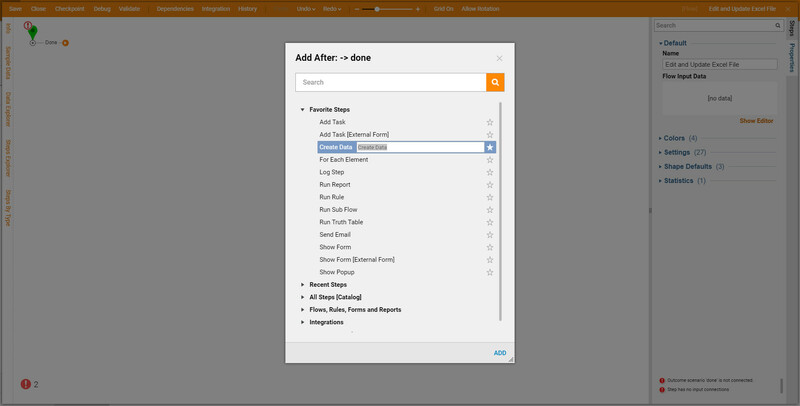 We begin in the Designer Folder with clicking Create Flow	option from the Folder Actions panel. 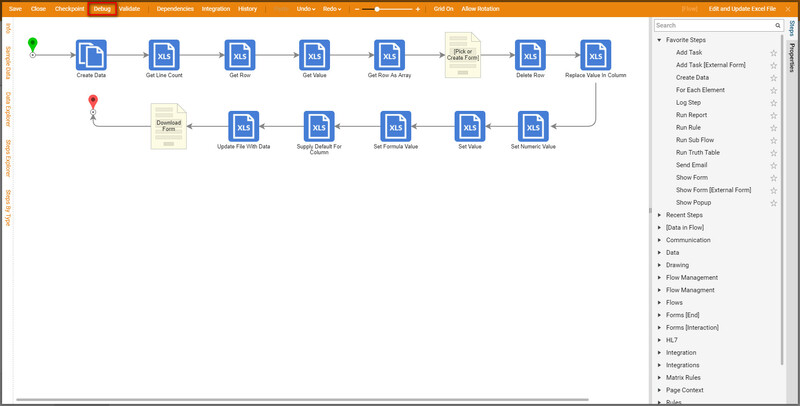 In the Flow Designer we are going to use Create Data	step to get an Excel Document. 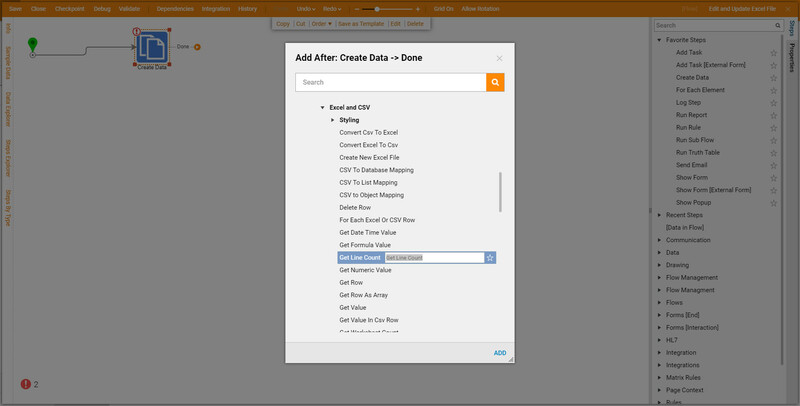 In the Quick Add Step	dialog we can use Search Bar	to locate Create Data Step. 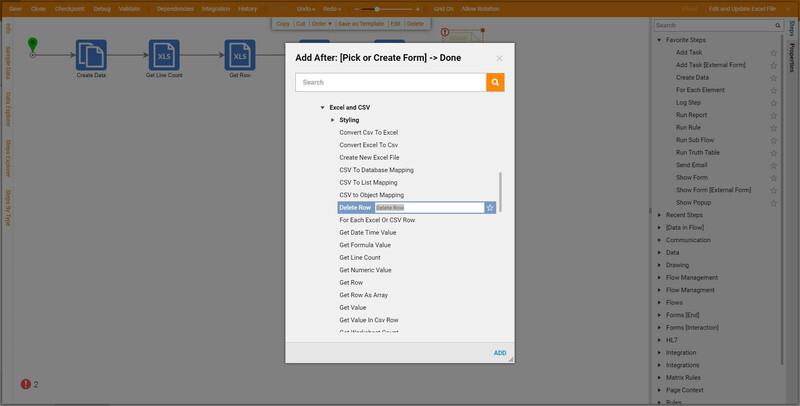 After we clicked Add	for Create Or Copy Data step, we need to configure it. 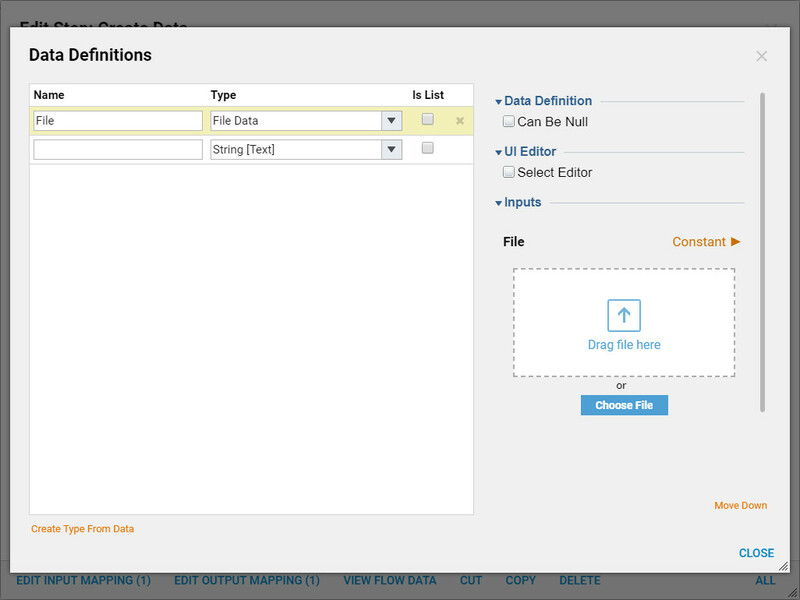 In the Data Definitions	pop-up window we click Add New	link to define our Data	. Then, we give our Data Name	, and define its type as FileData	. When finished, we can save and close this Data Definition window. 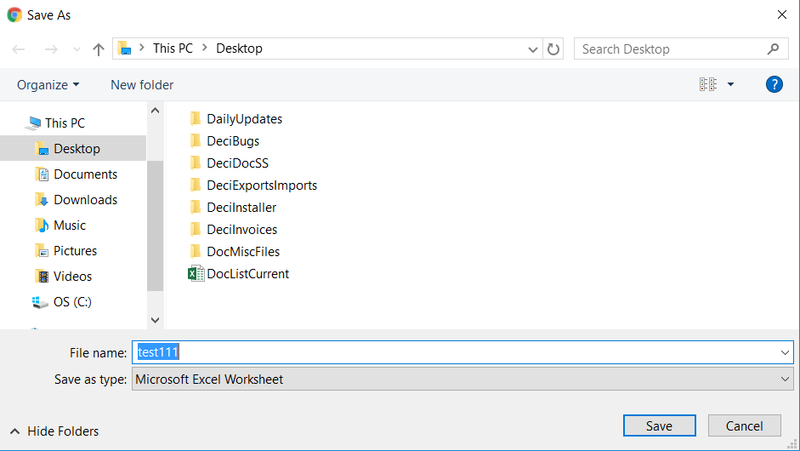 To pick the Excel Document	we navigate to the Properties	of Create or Copy Data step. 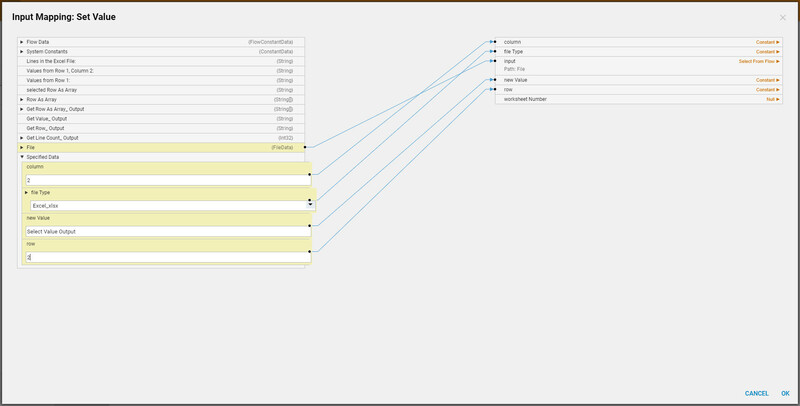 We locate Inputs	configurations and define a Mapping type	for the File variable as Constant	. Next, we use Value	picker	to pick the file we want to use. When we picked the file, its Name appears in the Value	box. 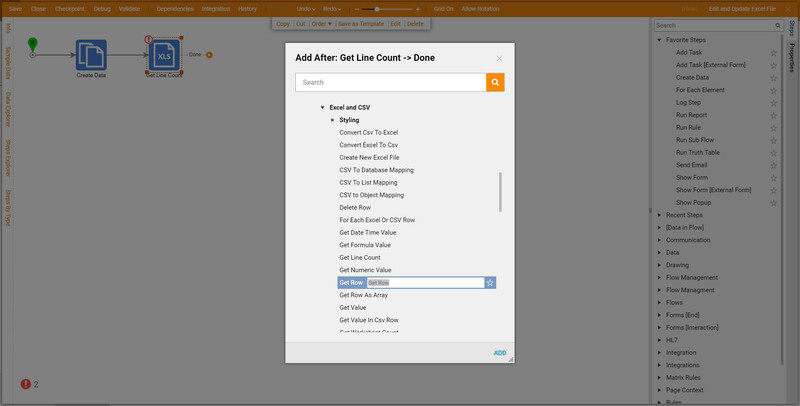 Next, we add Get Line Count	step from All Steps [Catalog] > Integration > Excel and CSV	category in the Quick Add Step	dialog*. 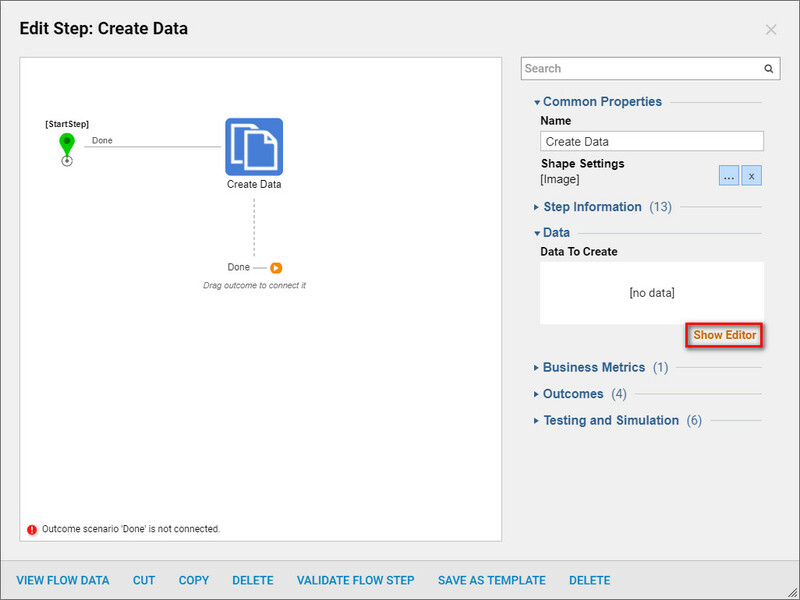 * We add this step next to Create Data	step in our Flow	. This step returns the number of Rows in the Excel Document. Then, we need to map data for this step. We choose Edit Input Mappings	option from this step’s Edit Step	pop up. 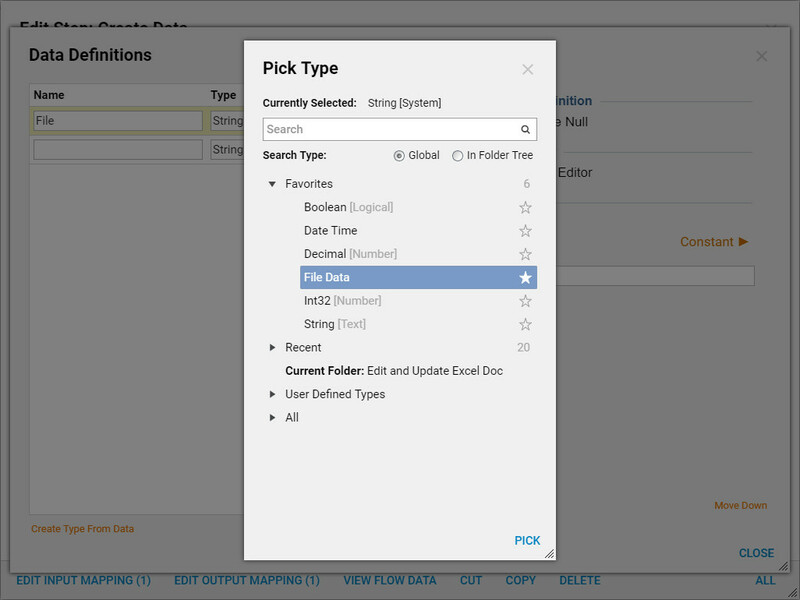 In the Mapping Editor we use our File	from Create or Copy Data step as an input	field. Next, we define file type , and disable	ignoreFirstRow	field. When finished, we click Ok	to save and close Mapping Editor. 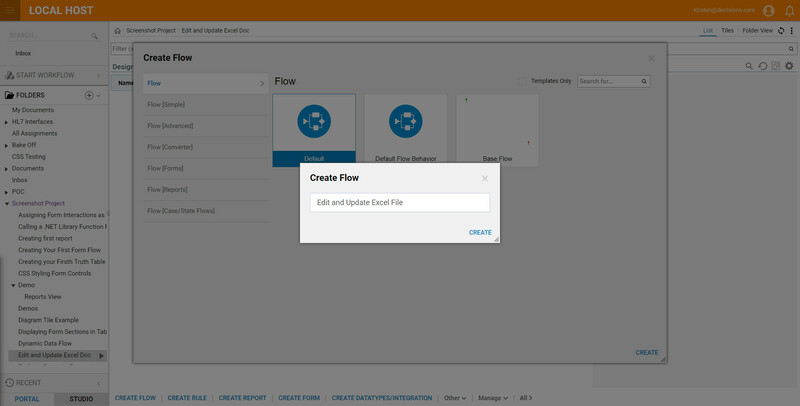 Back in the Flow Designer we add Get Row	step from All Steps [Catalog] > Integration > Excel and CSV	category in the Quick Add Step	dialog*. * This step returns data in the desirable Row . 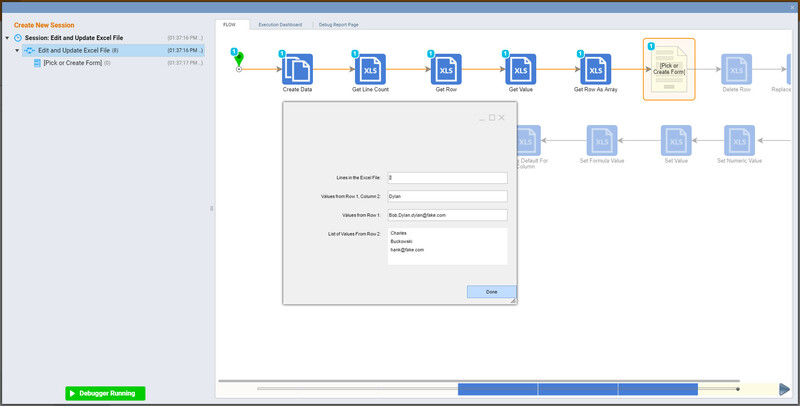 To configure this step we call Mapping Editor , like we did for the previous step. Data mapping is similar to the previous step except we need to provide this step with the desirable Row Number. Rows in this step are zero indexed. In this example we want this step to return first Row from our Excel Document so we input 0	as the Value	for the Constant rowNumber	field. Then, we save and close Mapping Editor. 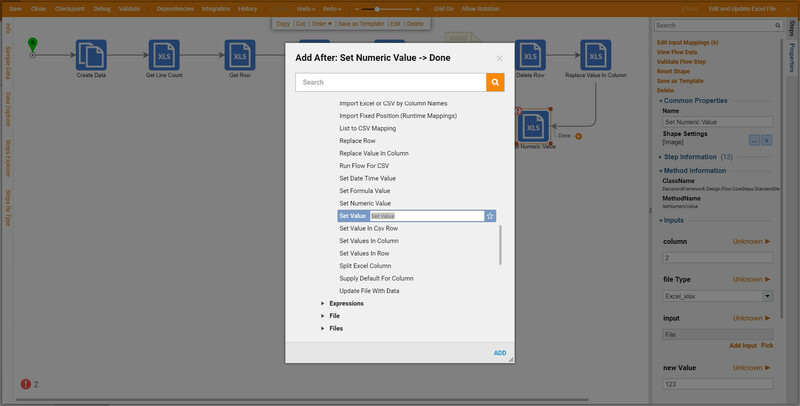 Back in the Flow Designer we add to our Flow Get	Value	step from All Steps [Catalog] > Integration > Excel and CSV	category in the Quick Add Step	dialog. This step gets data from the desirable cell in the Excel File. 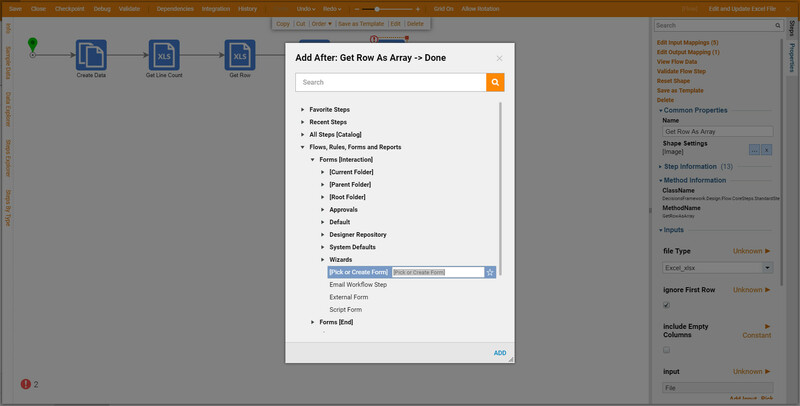 Back in the Flow Designer we add to our Flow Get Row As Array	step from All Steps [Catalog] > Integration> Excel and CSV	category in the Quick Add Step	dialog. This is another option to get data from the desirable Row in the Excel File . In this case the Step returns an Array	of Strings	. Each String	in this Array is a single Value	from each column in the Row . Again, we call Mapping Editor to map data for this Step	. 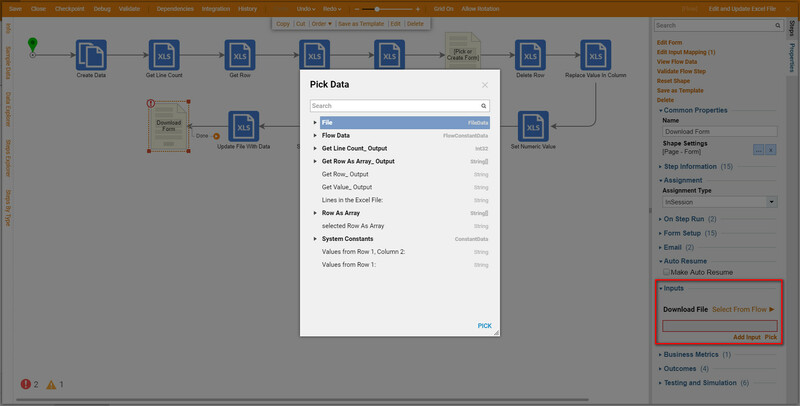 Data mapping is the same as for Get Row	step. In this example we want to return second Row so we input 1	for rowNumber	field. Click Ok	to save and close Mapping Editor. 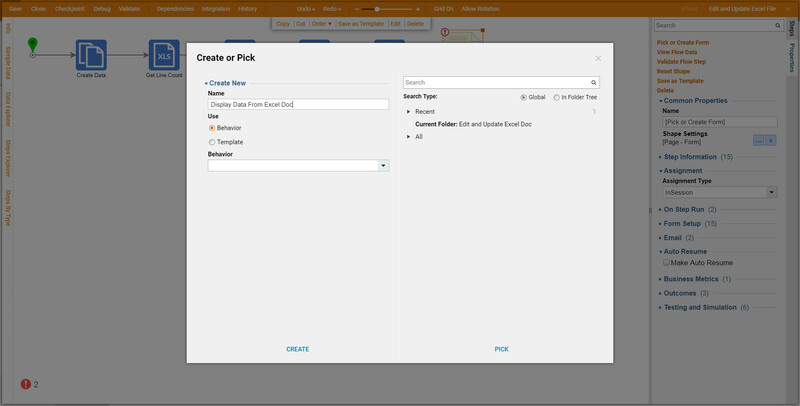 After we added [Pick or Create Form]	step we click Pick or Create Form	link. 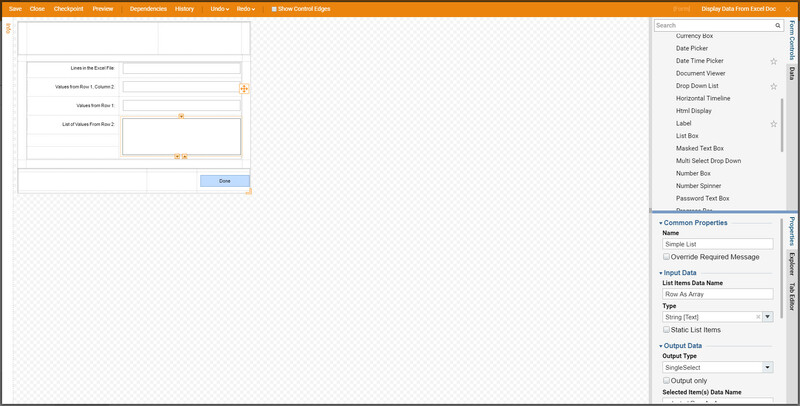 Then, in the resulting pop-up window we Name	our Form and click Create	to proceed to the Form Designer. Our Form Design is simple. 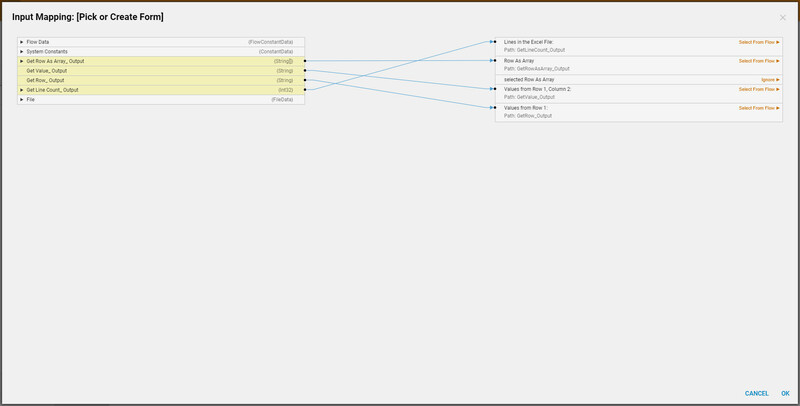 We use Label	components from Data	category to indicate what Data we are displaying. Next, to display actual values, we use Text Box	compoments. To display the Array of Strings	that our Get Row As Array step returns, we use aList Box	component from Data >	List	category in the ToolBox	. We configure this list as following. We define its Type String	and provide the required field values. 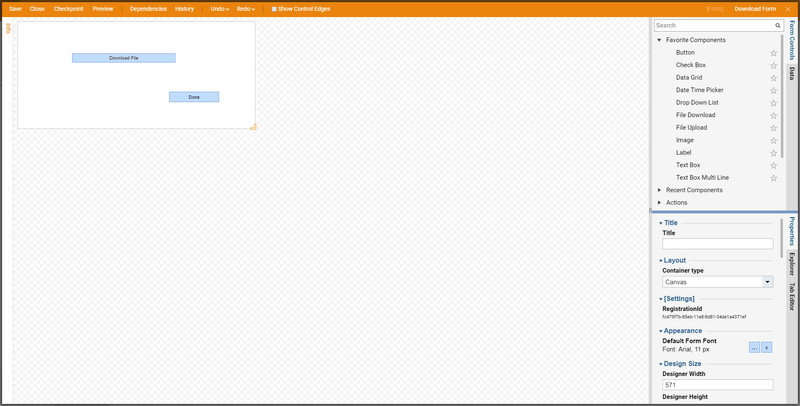 Finally we used Button	component from Actions	category as an outcome from our Form . When we finish our Form design we can save the Form and close the Form Designer. 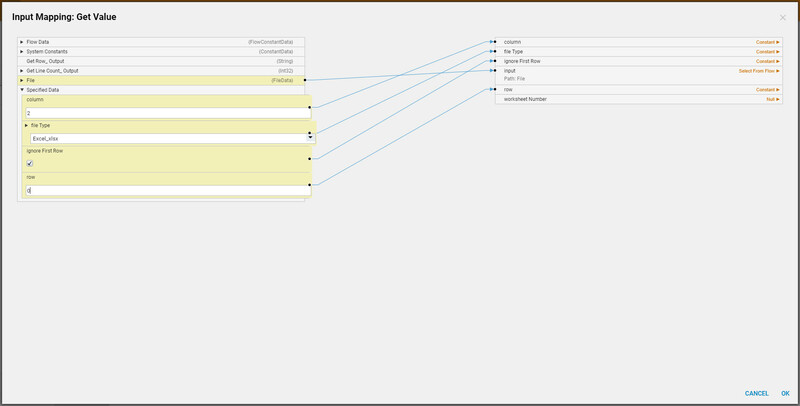 Back in the Flow Designer we use Mapping Editor	to map data to our [Pick or Create Form]	step. 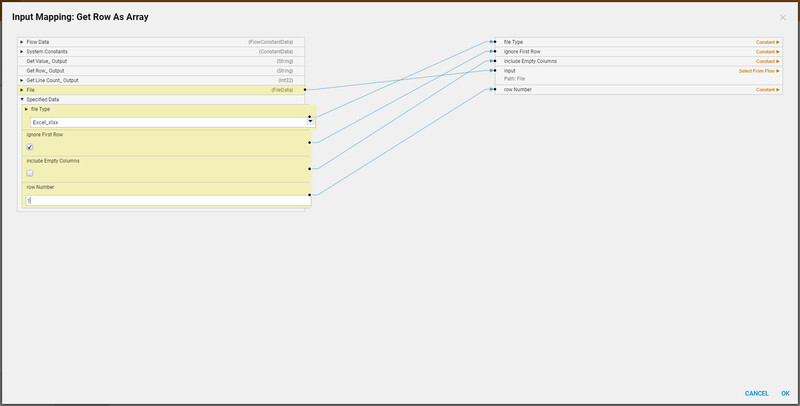 In the Mapping Editor all data should be mapped except for our Selected Value	component. 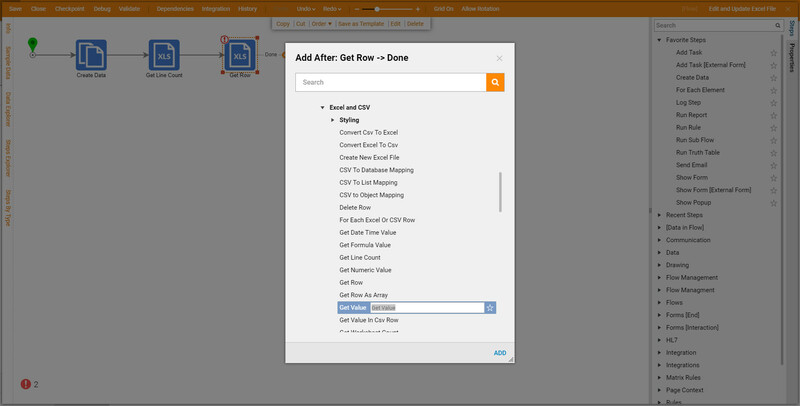 We connect the outcome from Get Row As Array	step to our RowAsArray	list on the Form . Then, we save and close Mapping Editor. Next part of this tutorial demonstrates how to edit Data in the Excel Document . 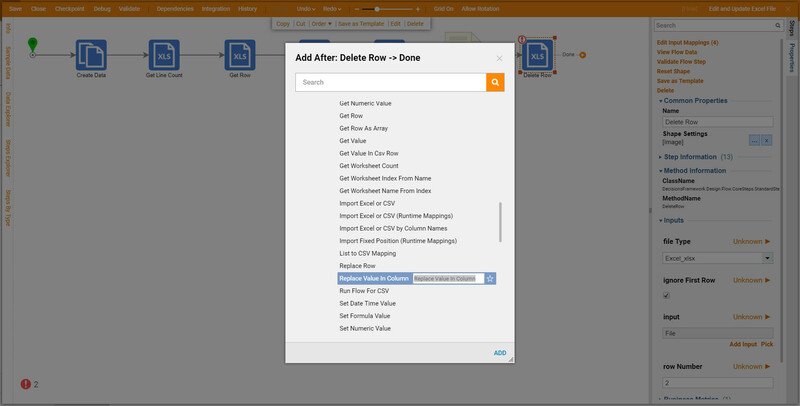 First, we are going to add a Delete Row	step from Integrations > All Integrations > Excel and CSV	category in the Quick Add Step	dialog. This step deletes a desirable Row from the Excel File. We call Mapping Editor for this step to map data. In the Mapping Editor we use our Excel File	as an input	field. Additionally, we define the fileType	, disable ignoreFirstRow	option and define the desirable rowNumber	that we want to delete. Row Numbers are 0	indexed. In this example we define rowNumber	2	because we want to delete third Row from our Excel File . Save and close Mapping Editor , when finished. Back in the Flow Designer we add Replace Value In Column	step from Integrations > All Integrations > Excel and CSV	category in the Quick Add Step	dialog. This step replaces value in the specified column in the Excel Document. We need to specify column for this step and a new value we want this step to replace with. Select Show Mapping Editor	from step’s Options Menu	. In the Mapping Editor we use our Excel File	as an input	field. Next, we define fileType	and a column	number. Mention, that for this step we need to define oldValue	and newValue	. This step iterates through the values in the defined column and if it finds oldValue , it replaces this value with newValue . 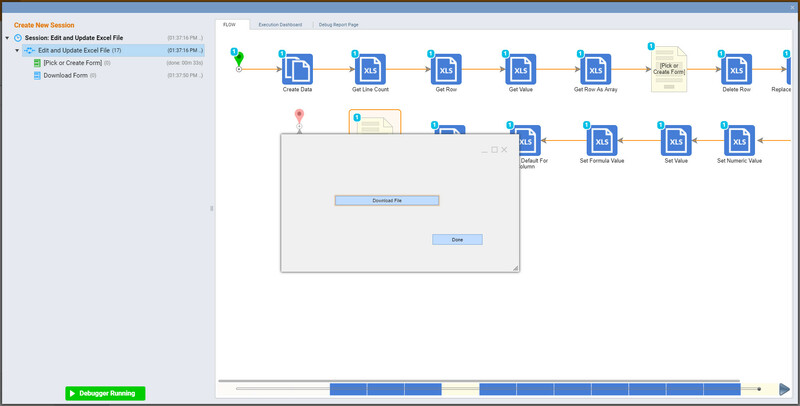 When we finished mapping data we can save and close Mapping Editor. Next, we add Set Numeric Value	step fromIntegrations > All Integrations > Excel and CSV	category in the Quick Add Step	dialog*. * This step is designed to set desirable numeric value for the specific cell in the Excel Document. This value will be treated in the Excel File as a number. We call Mapping Editor	for this step to configure it. Data Mapping is simple for this step. We use our Excel File	as an input	field. Then, we define column	and row	number where we want to set numeric value. Finally, we define desirable value. Click Ok	to save and close Mapping Editor. 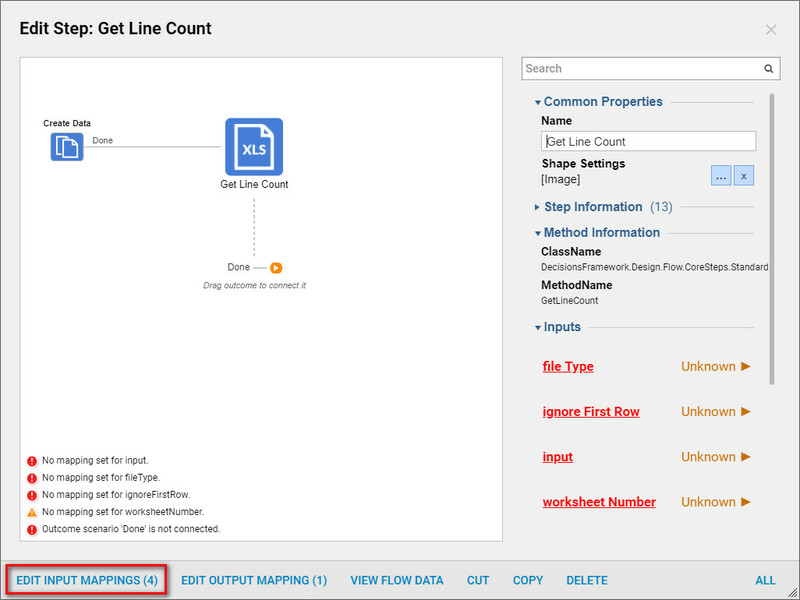 Data mapping in the Mapping Editor	for this step is the same as for Set Numeric Value	step, except this time we use a text string for newValue	field. Then, save and close Mapping Editor. We call Mapping Editor	for this step. In the Mapping Editor we use our Excel File	as an input	field. Then we define column	and row	number. Finally, in the newValue	field we type desirable formula for the Excel Document. Then, we click Ok	to save and close Mapping Editor. 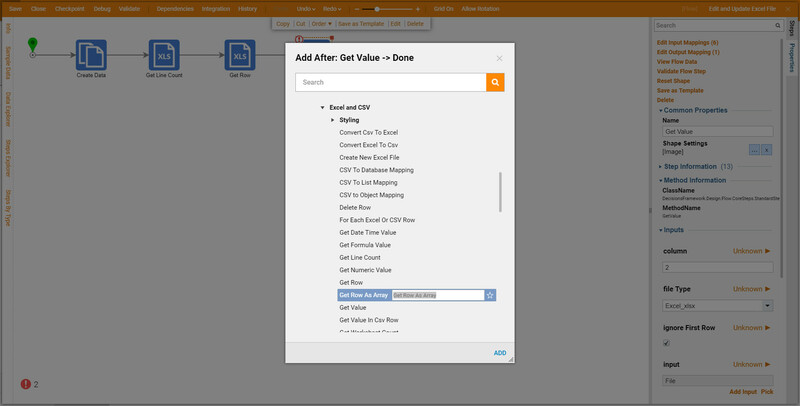 Back in the Flow Designer we add Supply Default For Column	step from Integations > All Integrations> Excel and CSV	category in the Quick Add Step	dialog. This step is designed to set desirable Default	values in column for the fields that are empty. 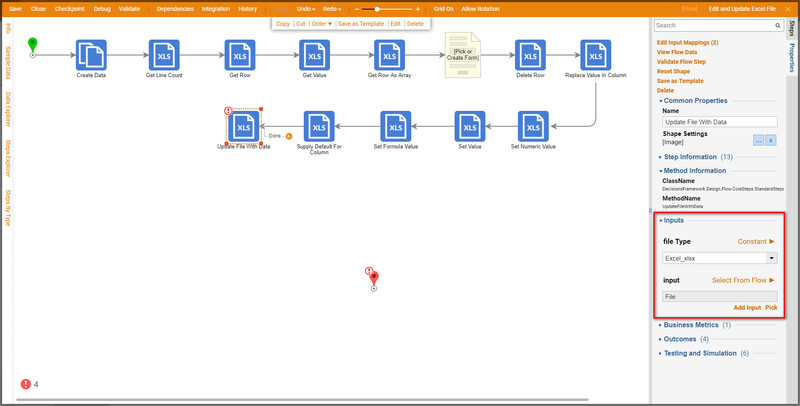 Data mapping is simple for this step. We use Excel File	as an input	. Then, we define column	number and provide defaultValue	field with desirable Default value. Then, we save and close Mapping Editor. We can use Properties	panel for this step to map the Data . 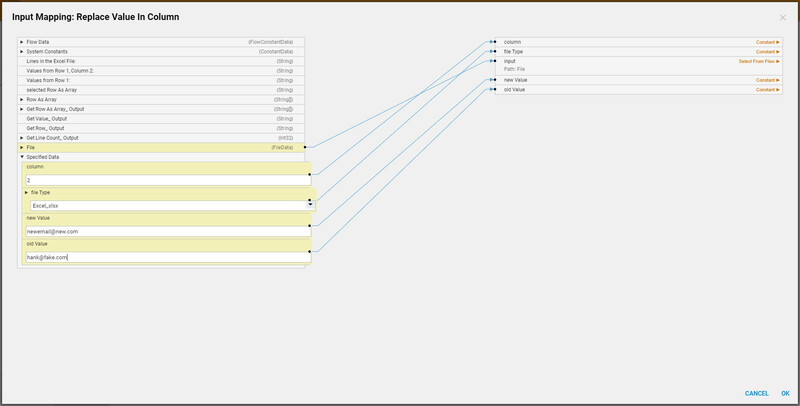 We locate Inputs	section in the Properties	and define fileType	as Constant	. Finally, for the input field we selectMapping type Select Value	, and use Path	picker to select our Excel File. Lastly, we need to add a Form	to our Flow for user to be able to download our updated Excel Document. 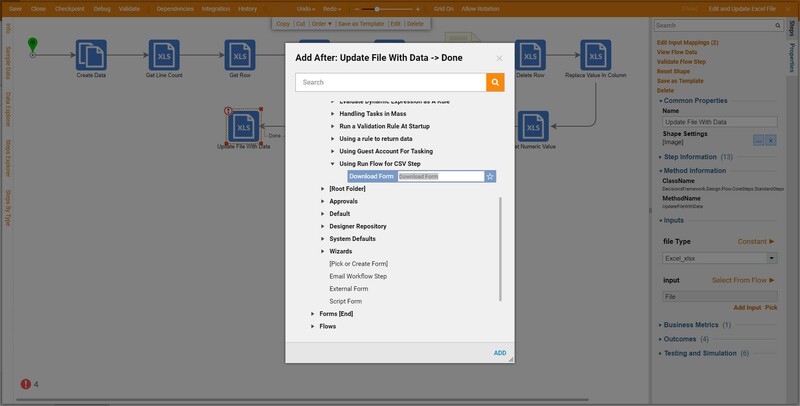 We use Download File Form	from Flows, Rules, Forms and Reports > Forms[Interaction] > [Current Folder]	category. This Form was predesigned for this tutorial. It simply has two controls on it. First, it is a Button	control from Actions	category. 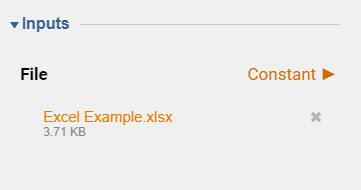 Second, it is File Download	component from File Handling	category. File Download component configured as following. 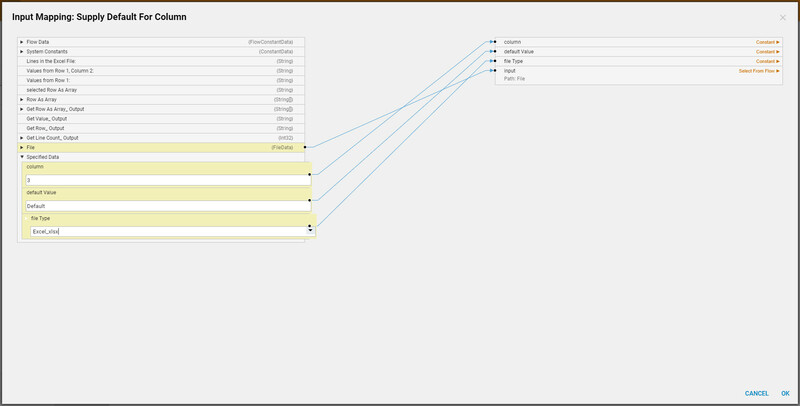 Back in the Flow Designer we need to map Data for our Form	step. We navigate to this step’s Properties	and locate Inputs	section. In the Inputs section we select Constant Mapping type	for DownloadFile	control and use Path	picker to select our Excel File. We connect	the steps in our Flow as follows. 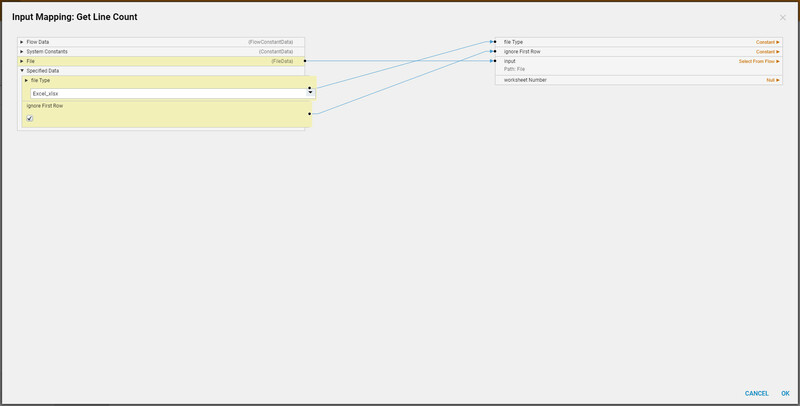 Next, we can click Debug Flow	link on the Top Panel in the Flow Designer to test our Flow . 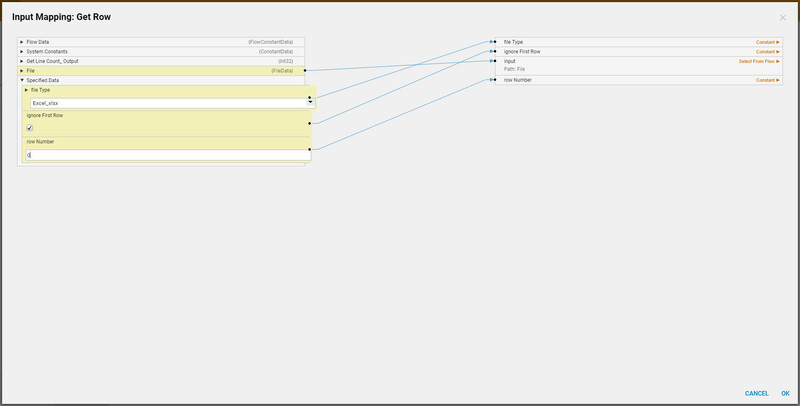 Our First Form opens in the Debugger	. We can see that it displays all information from our Excel Document as we designed. We click Done	to close the Form and continue Flow execution. Next, our Download File Form	opens in the Debugger . We click Download File	control. 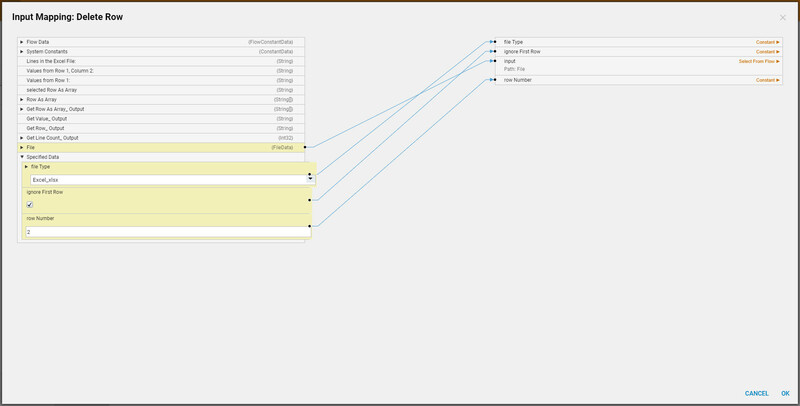 In the Diagram Tab	in the Debugger we can see that our Flow ran to theEnd Step	with no errors. We can locate and open our new Excel Document to observe all changes we have done to it in the Flow.